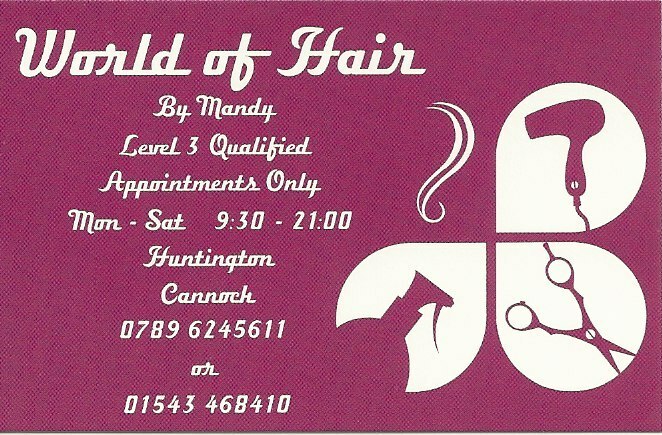 For all your hairdressing needs come along to World of Hair. Hairdressing, Perms, Colours, Cuts, Hair ups, Styles, Sets, Foils. Amanda is a Level 3 Qualified State Registered Stylist. 90% of Hairdressers are not State Registered. I have a home based Salon and offer Appointment only, no walk-ins. Call 07896245611 or 01543 468410 and ask for Mandy.